Singapore may have a reputation of being one of the most expensive destinations to visit, but that doesn’t mean that sightseeing on a budget is out of the question. There are a surprising number of attractions and activities that either cost a minimal amount, or nothing at all, including various arts and culture activities, food, sightseeing, and outdoor fun. Here are 10 of the best free and cheap things to do in Singapore. For a totally different garden experience in Singapore, make your way to Gardens by the Bay, over 101 hectares of reclaimed land that is now an awe-inspiring attraction. One of the most impressive aspects of the gardens are its Supertrees, looking like something straight out of a fantasy or sci-fi movie. These tree-like vertical gardens measure between 25 and 50 meters tall and 12 Supertrees (of 18 in total) can be found at the Supertree Grove, which are free to marvel at. If you do want to get up close to the futuristic botanic wonders, a walk on the OCBC Skyway, the 128-meter aerial walkway through the tops of the massive Supertrees, costs SGD $8. The walk is pretty spectacular and gives you epic views over the gardens and a chance to see the inner workings of the Supertrees, each made up of more than 300 species of plants. Founded in 1859, Singapore’s sprawling Botanic Gardens are also the country’s first UNESCO World Heritage Site. Located minutes from the shopping mecca of Orchard Road, the gardens offer a welcome breath of fresh air and the chance for solitude in the middle of the city. Wind your way through the various gardens that include more than 10,000 plant species and habitats, from rainforest to desert, as well as bonsais, palms, a healing garden, ginger garden, fragrant garden, and much more. It’s easy to spend an entire afternoon here, exploring at a relaxed pace. Entrance to all gardens except the National Orchid Garden are free, but the more than 1,000 orchid species and 2,000 hybrids are worth the SGD $5 admission. Singapore’s national icon, the Merlion, is a mythical creature with the head of a lion and the body of a fish. The creature’s head represents Singapore’s original name, Singapura, or ‘lion city’ in Malay and the body represents Singapore’s beginnings as a fishing village. You can pay a visit to the Merlion at Merlion Park for free and pose for a photo with the iconic water-spouting statue (a popular activity among both locals and visitors), which stands nearly 9 meters tall and weighs 70 tons. Make your way to MacRitchie Nature Trail & Reservoir Park for the chance to spend some quality time outdoors and get your head above the trees via the park’s Treetop Walk, a 250-meter, aerial free-standing suspension bridge spanning the two highest points within MacRitchie and rising up to 25 meters above the forest floor. Hike along the reservoir to the Treetop Walk for a bird’s eye view of the forest canopy and its inhabitants. Entrance to the park and Treetop walk is free. Singapore’s Sentosa Island is home to many paid attractions, but you can take advantage of the island’s beaches without having to reach into your pocket. The three beaches on Sentosa include Siloso, Palawan, and Tanjong, and they each offer something different. Siloso is the busiest beach with a bulk of bars, restaurants, and attractions. Tanjong Beach is a quiet beach conducive to couples or anyone wanting to stretch out on the sand in peace, and Palawan is a family-friendly beach perfect for kids and also where you’ll find a suspension bridge linking beach-goers to the Southernmost Point of Continental Asia. Walk (or take the travelators) along Sentosa Boardwalk and then you can take free transportation within Sentosa to your beach of choice. 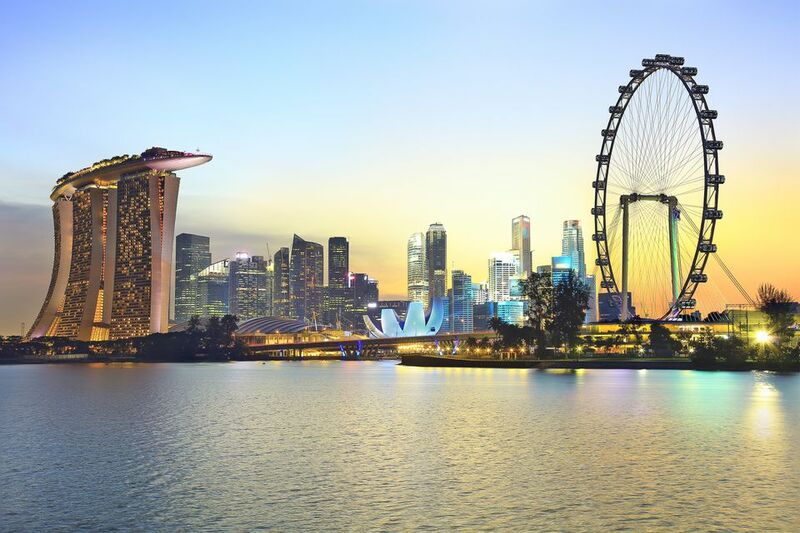 Singapore’s iconic skyline is beautiful and definitely Instagram-worthy. One of the best spots to view it is from the Marina Bay Sands Boardwalk. If you make your way there at 8 and 9 p.m. you can check out Spectra, the free outdoor light and water show set to an orchestral soundtrack put on by Marina Bay Sands. Esplanade Theatres on the Bay is Singapore’s premiere arts center and one of the busiest art centers in the world. While there are many ticketed events available, 70 percent of Esplanade’s programs are free. Events happen every evening at the Esplanade Concourse and every weekend and public holiday at the Esplanade Outdoor Theatre, ranging from dance and acoustic sets to live bands and theater performances. This waterfront setting is perfect for catching a free performance, and the architecture of the Esplanade is also noteworthy (and Instagram-worthy). The unique, spike design is referred to by locals as the “durian” thanks to its resemblance to the notoriously stinky fruit. Despite its reputation as an expensive destination, it’s very possible to eat cheaply in Singapore, and one of the best places for a budget-friendly meal is at one of the city’s many hawker centers. You’ll find a variety of Chinese, Malay, and Indian dishes being served from stalls in something that looks like a covered food court. Some of the best hawker centers for a cheap and delicious local meal include Maxwell Food Center, Lau Pa Sat, Hong Lim Food Centre, and Old Airport Road Food Centre. For another free opportunity to get outside and see some of the vibrant greenery Singapore is known for, go for a hike along the Southern Ridges. This area is comprised of 10 kilometers of green, open spaces that connect Mount Faber Park, Telok Blangah Hill Park, HortPark, Kent Ridge Park, and Labrador Nature Reserve. While you’re there, don’t miss a visit to Henderson Waves, a unique undulating bridge connecting Mount Faber Park to Telok Blangah Hill Park. At 36 meters above Henderson Road, this is Singapore’s highest pedestrian bridge. You might not think of a hotel as a go-to place to see some amazing art, but the Ritz-Carlton, Millenia Singapore is home to one of the world’s most impressive hotel art collections, with more than 4,200 pieces, including works by Frank Stella, Andy Warhol, and Dale Chihuly. Ask for the complimentary art tour podcast from the concierge for a comprehensive look into some of the property’s most impressive pieces. Another option for free art comes courtesy of ION Orchard, a gleaming mall in Singapore’s Orchard Road shopping area. Exhibitions at ION Art are focused on is focused on modern and contemporary art and design and admission to the gallery is free.